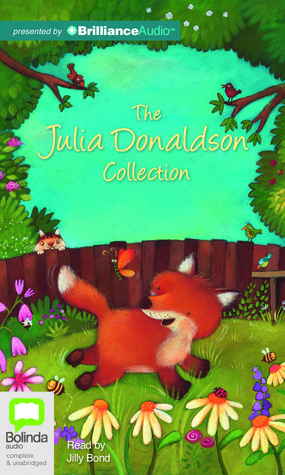 Julia Donaldson Jilly Bond - Growing upI grew up in a tall Victorian London house with my parents, grandmother, aunt, uncle, younger sister Mary and cat Geoffrey (who was really a prince in disguise. Mary and I would argue about which of us would marry him).Mary and I were always creating imaginary characters and mimicking real ones, and I used to write shows and choreograph ballets for us. A wind-up gramophone wafted out Chopin waltzes.I studied Drama and French at Bristol University, where I met Malcolm, a guitar-playing medic to whom I’m now married. Busking and booksBefore Malcolm and I had our three sons we used to go busking together and I would write special songs for each country; the best one was in Italian about pasta. The busking led to a career in singing and songwriting, mainly for children’s television. I became an expert at writing to order on such subjects as guinea pigs, window-cleaning and horrible smells. “We want a song about throwing crumpled-up wrapping paper into the bin” was a typical request from the BBC. I also continued to write “grown-up” songs and perform them in folk clubs and on the radio, and have recently released two CDs of these songs. One of my television songs, A SQUASH AND A SQUEEZE, was made into a book in 1993, with illustrations by the wonderful Axel Scheffler. It was great to hold the book in my hand without it vanishing in the air the way the songs did. This prompted me to unearth some plays I’d written for a school reading group, and since then I’ve had 20 plays published. Most children love acting and it’s a tremendous way to improve their reading. My real breakthrough was THE GRUFFALO, again illustrated by Axel. We work separately - he’s in London and I’m in Glasgow - but he sends me letters with lovely funny pictures on the envelopes.I really enjoy writing verse, even though it can be fiendishly difficult. I used to memorise poems as a child and it means a lot to me when parents tell me their child can recite one of my books.Funnily enough, I find it harder to write not in verse, though I feel I am now getting the hang of it! My novel THE GIANTS AND THE JONESES is going to be made into a film by the same team who made the Harry Potter movies, and I have written three books of stories about the anarchic PRINCESS MIRROR-BELLE who appears from the mirror and disrupts the life of an otherwise ordinary eight-year-old. I have just finished writing a novel for teenagers.When I’m not writing I am often performing, at book festivals and in theatres. I really enjoy getting the children in the audience to help me act out the stories and sing the songs. When Malcolm can take time off from the hospital he and his guitar come too. and it feels as if we’ve come full circle - back to busking.